This month's blog series is dedicated to Microsoft's flagship smart glass - HoloLens. Released in the US in March 2016, Microsoft's smart glasses offer exciting possibilities for mixed reality! At the interface of augmented and virtual reality, mixed reality is created. Components of both technologies converge here and offer astonishing possibilities to those who dive into their world. With the HoloLens, technology giant Microsoft offers wireless Windows 10 based binocular smart glasses with transparent lenses and an integrated headset. They allow three-dimensional models that are added to the user’s reality. Equipped with a precise inertial sensor (combination of acceleration and position sensors), a depth camera, four ambient cameras, a 2 megapixel camera for HD photo and video recordings, four microphones, speakers and a spatial light sensor, the HoloLens has an enormous capacity for its environment. Through the IMU (Inertial Measurement Unit) and the ambient cameras, HoloLens perceives its environment as three-dimensional space, can calculate the surface structure of objects and determine its own position in space. The integrated HPU (Holographic Processing Unit), specially developed for the HoloLens, processes the numerous gigabytes of data recorded per second by the HoloLens sensors. This processed data is then forwarded to the CPU (Central Processing Unit). Thanks to this interaction of GPU (graphics processing unit), HPU and CPU full computing power is guaranteed when running Windows 10 and the HoloLens can be used completely autonomously without an external computer. With the integrated depth camera, it is possible to “pin” holograms generated by the glasses directly into the room. The kind of holograms is manifold - from desktop shortcuts, folder windows or video conferences over three-dimensional objects, up to the Jump 'n Run game on the furniture of your own living room, everything is possible. If a hologram is positioned in the room, you can interact with it - similar to a mouse and the Windows Explorer. The difference: the cursor is moved using gaze tracking and the HoloLens typical gesture (thumb and index finger form a large “L” in front of the glasses and are quickly snapped together for selecting an item or a setting). For example, the mentioned car is moved to a suitable position with the help of the view (if an obstacle is in the way, the glasses recognize it), “parked” there by finger gesture and then viewed true to scale from all sides - and this also applies to the interior. Doors can be opened with the flick of a finger. HoloLens offers enormous potential for further development in the field of quality assurance and 3D inspection. High-resolution video recordings can also be made so that what you see can be documented for later retracing or can be transmitted via live stream. Connection to the Internet is via WiFi and the battery lasts about three hours under constant use (up to 14 days in standby) and is charged via micro-USB cable. The glasses are fully functional during the charging process. A 3.5mm output jack is also provided for connecting external audio players. At Ubimax, HoloLens plays an important role in research and development. The large recording potential of the sensors offers much room for new findings in augmented and mixed reality. The “RadAR+” research project, for example, sheds light on the topic of indoor navigation, which works with holograms projected onto the data glasses, such as direction arrows or information boards. HoloLens also offers exciting industrial applications. Work instructions, measurements, building instructions or step-by-step instructions can be displayed using three-dimensional holograms. Together with the PTS Logistics Group, applications for efficient repackaging of goods were tested in an exciting showcase. 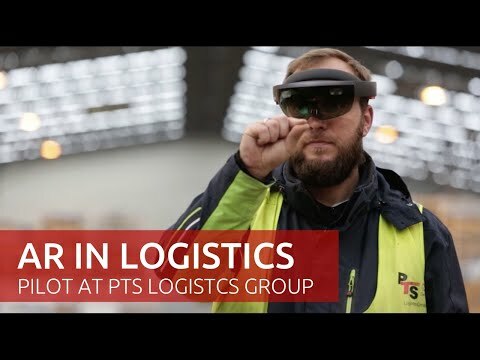 Thanks to its advanced sensor technology, HoloLens is the first smart glass that can be used completely autonomously and offers an unprecedented number of application possibilities that offer great potential for innovation in both industry and the private sector. We are eagerly awaiting further developments and will of course remain at the forefront when it comes to exploiting the full potential of Microsoft's mixed reality glasses!